Self-inking date stamp that enables users to mark documents with both the date and personalised text. 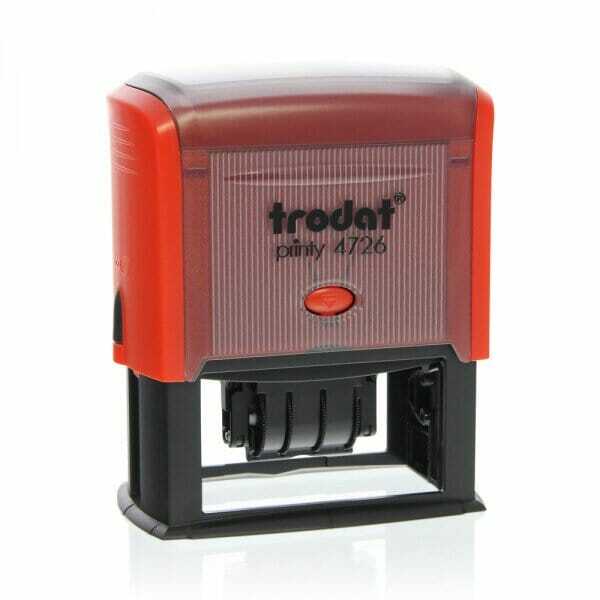 The Trodat Printy 4726 Dater rubber stamp is a conveniently sized self-inking date stamp, from the Printy range of stamps. The stamp creates a rectangular 75 x 38 mm impression, which can include a maximum of 6 lines of personalised text alongside the printed date. The date band on the stamp includes: date, month and 12 consecutive years. Your own chosen text can be added effortlessly online using the built in design platform. As standard the 4726 includes a built in dual colour blue and red ink pad, however if this can be easily replaced with an ink pad of following colours: black, red, blue, green or violet. Dry felt pads are suitable for special inks. Customer evaluation for "Trodat Printy Dater 4726 75 x 38 mm - 3+3 lines"